(1) Travelling Amsterdam to Brussels or Amsterdam to Antwerp, which can be done either using the high speed Thalys train or by the Intercity Brussels train. 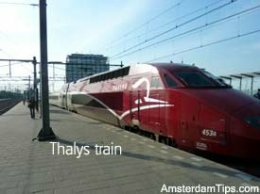 The direct Thalys train runs 12x daily from Amsterdam and takes 1 hour 10 minutes to Antwerp or 1 hour 49 minutes to Brussels Zuid/Midi. The 16x daily Intercity Brussels can get you to Antwerp in 2 hours 20 minutes or Brussels in 3 hours 20 minutes. (2) From Antwerp or Brussels take a frequent Belgian Rail Intercity service to Bruges which goes via Ghent St Pieters. Antwerp-Bruges runs hourly taking just under 1 hour for Ghent and 1 1/2 hours to Bruges. There is also an additional Antwerp-Ghent Intercity service running hourly. The Brussels Zuid-Ghent-Bruges Intercity runs up to 4x hourly. Travel time is 30 minutes to Ghent and 1 hour to Bruges. Expect the total journey time from Amsterdam to Bruges to be just over 3 hours if taking the Thalys via Brussels or about 4 hours if using Intercity trains to Belgium. Likewise, Amsterdam-Ghent will take about 2 hours 30 minutes using Thalys and 3 hours 30 minutes with Intercity trains. If taking the Intercity it's really up to you whether you change in Brussels or Antwerp. For Intercity travel there are standard fixed prices (2017): Amsterdam-Bruges one-way costs €53.20 (2nd class) or €86.20 (1st class). Other cheaper fares are the super day return valid weekdays: €69 (2nd class) or €111.40 (1st class); Benelux weekend return: €63.80 (2nd class) and €86.20 (1st class) which is valid Fri-Sun outbound and Sat-Sun for the return. 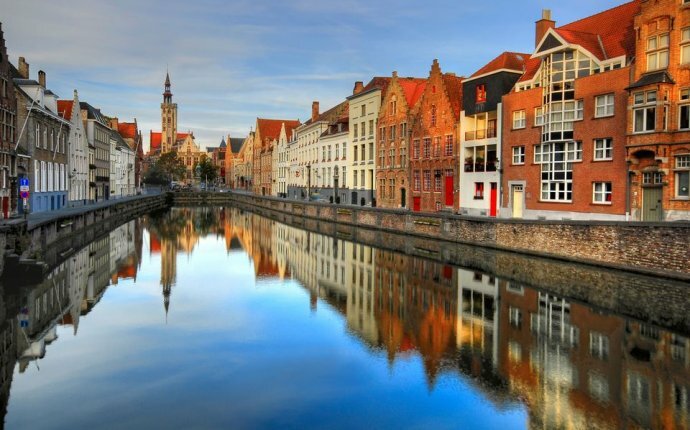 Amsterdam-Ghent prices are as follows: one-way €46.80 (2nd class) or €76.40 (1st class); super day return €60 (2nd class) or €97.80 (1st class); Benelux weekend return: €56 (2nd class) and €76.40 (1st class). These fixed fares mean you can turn up on the day and pay these ticket prices. Intercity fares do not have seat reservations - you just find a free seat available in your travel class. Holders of Dutch Railways NS discount cards receive a slight fare reduction off the Netherlands segment of travel. Travellers aged under 26 get a 35% discount off international tickets for travel between Netherlands and Belgium using standard trains. Tickets on Thalys are sold like airfares with mandatory seat reservations and prices rising closer to the travel date. You can buy an Amsterdam-Bruges or Amsterdam-Ghent rail ticket which includes the Thalys component but expect the price to be higher than the Intercity unless booking well in advance. Thalys can be booked up to 3 months out. The main railways stations in Bruges and Ghent are about a 10-15 minute walk from the city centre. As Belgium and Netherlands are members of the Schengen Zone agreement you do not need to go through a passport control check when travelling between Amsterdam and Bruges.